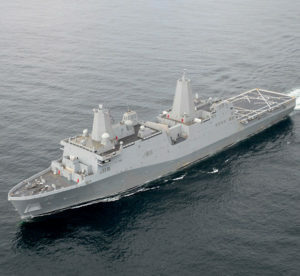 The future amphibious transport dock ship Pre-Commissioning Unit (PCU) John P. Murtha (LPD 26) conducts builder’s trials March 4, 2016 in the Gulf of Mexico. Sailors aboard the Pre-Commissioning Unit John P. Murtha (LPD 26) successfully tested the Navy’s first High Frequency Distribution Amplifier Group (HF DAG) system during Builder’s Sea Trials March 1-3 and Acceptance Sea Trials April 13-15 in the Gulf of Mexico. During these trials, the HF DAG system successfully transmitted and received transmissions between LPD 26 antennas and established contact with other vessels, such as the USS Montgomery (LCS 8) afloat. In addition, communication with naval shore stations more than 200 miles away in Mayport, Fla., proved the dependability of the system. HF DAG is a user-friendly system that utilizes touch screen technology compatibility with commercial equipment, which saves the military substantial financial cost, Saewert said. The Navy will not have to develop a unique system to accomplish the same task. Nathaniel Panis, HF DAG In-Service Engineer attached to Space and Naval Warfare Command and who assisted in the Builder’s Sea Trials, said several types of communications methods are employed by the military. One example is digital modular radio (DMR), which provides multiple wavelength, waveforms and information security for voice and data communications. Ensign Eric Barkley, LPD 26 information systems officer, said these events are a clear victory for John P. Murtha. John P. Murtha will commission later this fall.